With the implementation of the Real Estate (Regulation and Development) Act (RERA) across states, the emerging clarity and transparency in registered projects is slowly but surely leading to an uptick in home sales. Leading developers DLF Ltd and Sobha Developers Ltd indicated a return of demand and enquiries for housing projects during the quarter. Yet, it was the office and retail lease rentals that spurred revenue growth. Home sales in DLF started on a positive note in November, when it resumed selling after RERA compliance. 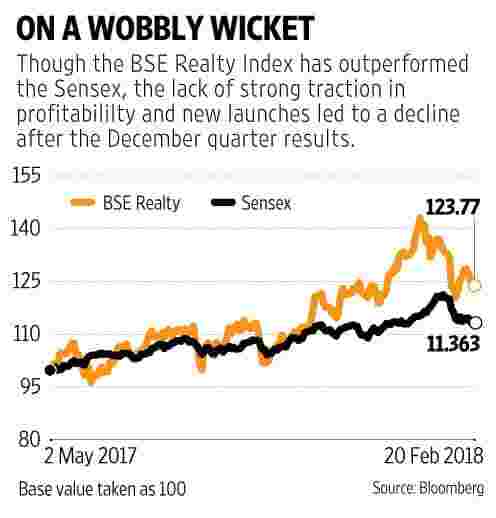 Mumbai-based Oberoi Realty Ltd clocked the biggest 43% jump in booking value on the back of a low base and sales at two large Mumbai residential projects. Although affordable housing sales are gaining momentum in the post-RERA regime, few of these builders are present in the listed universe. So the decent revenue growth among listed firms such as Oberoi and Phoenix Mills Ltd was supported largely by a double-digit jump in rental income in malls. A recent report by ICICI Securities Ltd said, “the strength in office market is clearly visible with rents in preferred micro-markets in cities of Bengaluru, Hyderabad and Pune continuing with 5-10% appreciation in CY2017 and Grade A vacancy levels remaining below 10%." In fact, the short supply of office space in favourable locations suppressed growth rates during the quarter. Most managements are confident of a pick-up in home sales in 2018. That said, Sobha and DLF have unsold inventory although this is unlikely to deter them from launching projects in areas with absorption capacity. But the more immediate opportunity in office and retail rentals is mirrored in most firms’ decisions to scout for land parcels to expand this activity. Of course, this is not to say that profitability improvement will follow suit. Firms have managed to sustain margins. Analysts believe they may need to sell land banks in unviable areas to pare debt. Among the lot, DLF’s wheel of fortune turned in its favour as the deal to sell promoter stake in the commercial entity bore fruit and the funds have been used to trim debt. This is key to bringing back investor confidence in the sector. Another positive trigger is news on new launches in the residential market.